Glenmorangie has announced the third whisky in its Bond House No 1 Collection: Glenmorangie Grand Vintage Malt 1993, a 25-year-old whisky ‘finished’ in ex-Madeira casks for 15 years. A travel retail exclusive, Glenmorangie Grand Vintage Malt 1993 spent a decade in ex-Bourbon casks, before being transferred to casks previously used to mature Bual Madeira, where it spent another 15 years. It is described as having a ‘rich, bittersweet taste’ and displaying the ‘utmost depth and minerality that a Madeira finish can bring to Glenmorangie’s elegant house style’. ‘The flinty intensity of Glenmorangie Grand Vintage Malt 1993 is a rare tribute to the distillery’s new, more exacting approach to whisky creation,’ said Dr Bill Lumsden, Glenmorangie’s director of whisky creation, distilling and whisky stocks. This is the third release in Glenmorangie’s Bond House No 1 Collection, which takes its name from the largest of the Highland distillery’s 19th-century bonded warehouses, converted into a still house in 1990. 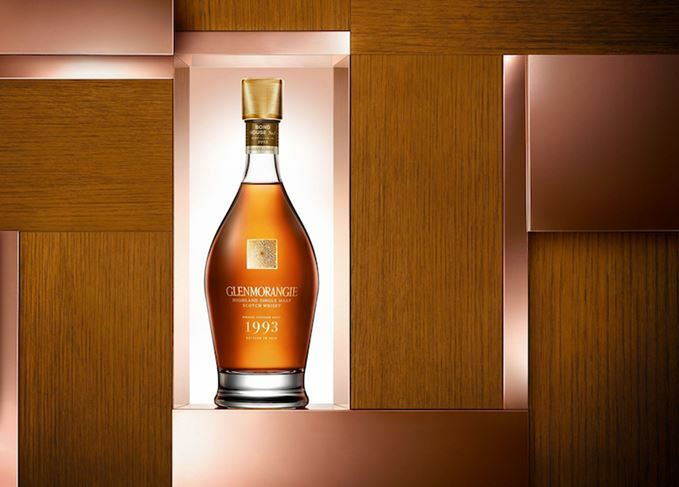 The first expression, Glenmorangie Grand Vintage Malt 1990, was released in 2016, followed earlier this year by the launch of Glenmorangie Grand Vintage Malt 1989. Glenmorangie Grand Vintage Malt 1993, bottled at 43% abv, will be available in travel retail, priced from £512/€575 a bottle. The release is the first from Glenmorangie to be matured in Côte-Rôtie red wine casks. The 16-year-old single cask whisky is available from the distillery for £650 a bottle. The Highland distillery has married two ‘incongruous’ malts for its latest vintage release. The distillery’s 10th Private Edition whisky has been made using a strain of local yeast. The hand-built surfboards are the latest Beyond the Cask initiative from the single malt.